The Perfect gift for any occasion, a Wedding, a Birthday, an Anniversary or most importantly to say I love you. Individually hand crafted with love in a variety of special colours. THE COAST GLASS & DECANTER, HANDCRAFTED AND DESIGNED IN-HOUSE HERE AT NORTHCOASTGLASS BY BRODIE AND NICKY IS TRULY A UNIQUE OBJECT FOR THE WHISKY LOVER. 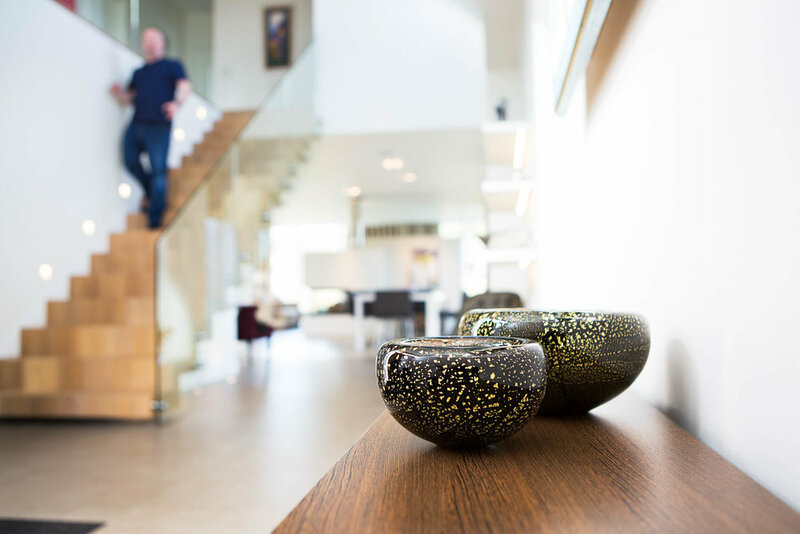 THE ROCKY CONTOURS ARE GENTLY PRESSED INTO THE SIDE OF THE VESSEL TO CREATE A UNIQUE, NATURAL ORGANIC FORM WITH ELEGANCE AND BEAUTY. This is one of our largest vases in the range and really it is a statement piece. It looks great with a long stemmed flowers like Lilies, Iris, Sunflowers, Roses, Bird of Paradise etc. 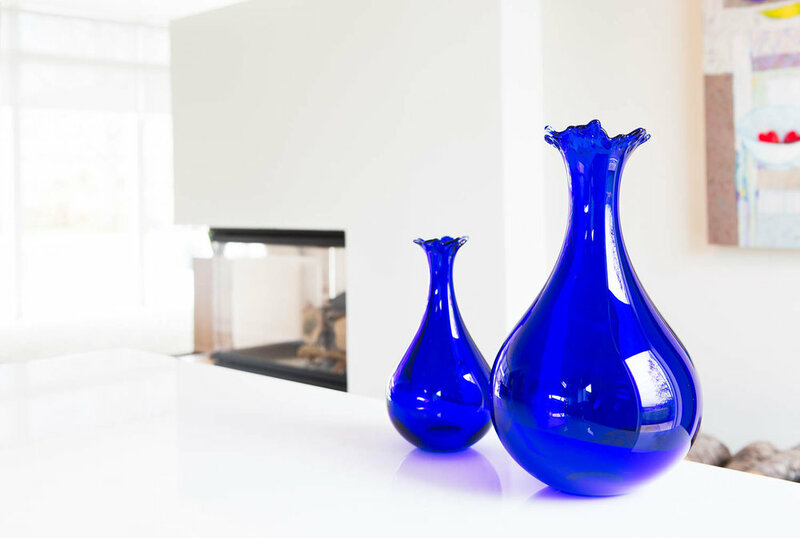 Our droplet vase large and small epitomises our design style and sensibility. This vase is contemporary and yet classic. This vase looks great with a single stem flower or on its own. The Rock series is a stunning range that is inherently elegant and rugged at the same time. This plate is generous in size and makes a stunning centre piece for any setting. The Rock bowl looks great on its own or full of your favourite fruit or treats. No two of these elegant contemporary works are the same. exciting and very beautiful. The Icy Decanter and glasses were the first decanters that we designed right back at the beginning. Designed to suggest a melted block of ice lovely the tactile nature of these of the glasses feels especially rewarding in you hand and the decanter is just stunning. The Wavy vase large or small is another favourite of ours and it pays homage to the great Finnish architect and designer Alvar Aalto and his legendary vase design “Leather trousers of Eskimo Woman” later to known as the “Savoy vase”. These vases we describe as nesting vases as they cuddle together in groups of 2 - 3 - 4. 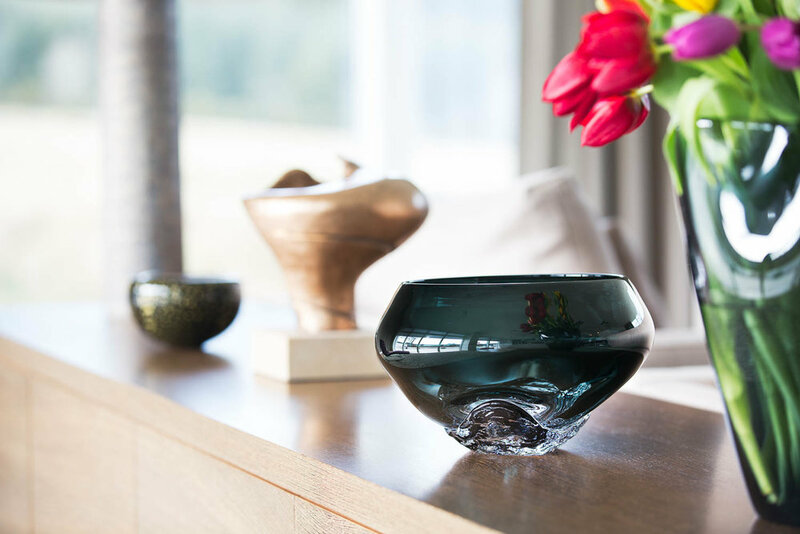 As vases work very well with flowers as the flowers naturally fall into the vases curved forms. AVAILABLE IN A VARIETY OF VALUES, AND CAN EITHER BE COLLECTED FROM THE GALLERY OR SENT TO YOU DIRECTLY.